If the meet is currently live you MUST add an athlete following these steps. Do not add them in Athlete Entries. If the "Entering Meet results" dialog appears for electronic timer selection, make any needed selections and click OK. 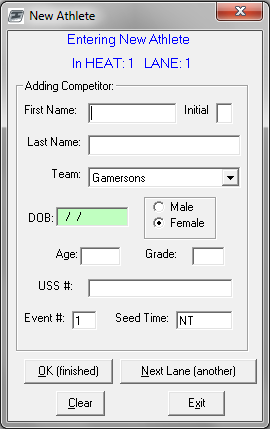 Select the event into which to add an athlete. Click Insert Athlete (1) (in meet already). Drag and drop an athlete from the right into an empty slot on the left. Click the cursor into an empty slot in the Time column. Click Insert Athlete (2) (not in meet yet). Fill the information in for a new athlete. If you have more than one to enter, click Next Lane (another). Once you have finished entering the athlete(s) click OK (finished).